Following the exploits of Michael Phelps and Usain Bolt in London, the word “greatest” has been getting thrown around quite a bit. As with any time this word comes out, one has to question just how much of it is driven by recency bias; that is, these are the greatest athletes currently in front of our faces, and suddenly the leap to greatest of all time doesn’t seem so far anymore. I prefer a bit more definitiveness to my debates than these discussions about “greatest” often provide, so I developed my own methodology for deciding the question, with one twist: I’m not necessarily looking for the greatest Olympian of all time, but instead the most dominant. I want to celebrate unyielding, unflappable, and unstoppable Olympic excellence, measured primarily in its weight in gold. Individual events only. I didn’t count any medal won with the help of another athlete, meaning I ignored relays, doubles sports, and team events (sorry, Misty and Kerri). The only medals tallied here are those earned by the athlete, and no one else. More points for shinier medals. As in my COSTAS medal tally, I used a 4-2-1 point system for crediting gold, silver, and bronze medals. I’m looking for the most dominant Olympian of all time, not just the one with the most staying power, so those who remained at the very top of their sport for multiple Olympics and amassed a large collection of golds are rewarded accordingly. Fewer points for more medal chances. To finalize the rankings, I divided the medal score derived from the above point system by the number of different events (i.e. the 200m butterfly and the 400m individual medley) in which an athlete participated. To determine how truly dominant an athlete was, the number of medal chances he or she had to secure his or her final haul should be taken into account. It can be argued that medaling in a variety of different disciplines should be rewarded and not penalized, but I think participating in a diversity of events reflects “most talented” rather than “most dominant.” To me, the question of dominance essentially boils down to who won the most golds given the fewest opportunities. Had politics not gotten in the way, Louganis could be even higher on this list. After winning his first medal—a silver, his only non-gold—in 1976 at the age of 16, Louganis missed the 1980 Games in Moscow as part of the United States’ Cold War boycott, despite being one of the primary contenders for gold in the 10m platform and 3m springboard. However, he made the most of his final two Olympic appearances, winning four golds in the aforementioned events in 1984 and 1988 and finishing off the greatest diving career of all time. Given that he has already been anointed the greatest Olympian of all time by most media outlets, fourth is a controversial position for Phelps. Though he certainly boasts the most impressive raw medal haul, Phelps is hurt by the number of events in which he competed, which gave him greater chances to earn that total. Whether this is fair or not, it remains that Phelps was not uniformly dominant in all of his events. When history reflects on his career, I think it will decide that he was otherworldly at one stroke (the butterfly, in which he won five of his individual golds), good at one stroke (the freestyle, which allowed him to participate in relays, more than anything), and competent at the other two, though “competent” might be an all-time understatement for someone who won five gold medals in individual medleys. Still, his record medal total could never have been reached without the diverse menu of events swimming offers its athletes, and for that, Phelps remains fourth, just out of the medals. Unfortunately for my generation, Lewis is now known more for his anthem butchering than his achievements on the track, despite being the second-most decorated track and field Olympian of all time. Lewis was Bolt before Bolt, winning back-to-back 100m golds—though one was awarded only after a doping disqualification leveled against Canadian Ben Johnson—to go with a gold and a silver in the 200m. But Lewis’ true dominance did not lie in sprinting. His best event was the long jump, in which he won gold at four consecutive Olympics, including one at age 35 in Atlanta. This is what separates him from Bolt; both were elite sprinters, but Lewis made the extra effort to convert that ability into long jump glory, something it has been suggested that Bolt could also have attained had he set his mind to it. Should Bolt successfully defend his 100m and 200m titles in 2016, he would surpass Lewis on this list, but given his present ambivalence, coupled with the rise of Yohan Blake, that seems increasingly unlikely. What? You hadn’t heard of Gert Fredriksson, the greatest canoeist of all time? I hadn’t either, but that says more about his sport’s place in our consciousness than it does about Fredriksson’s accomplishments. For four straight Olympics, Fredriksson ruled the 1,000- and 10,000-meter kayak races, taking gold in five of the seven races he entered, including two golds as a 37-year-old at the 1956 Melbourne Games. 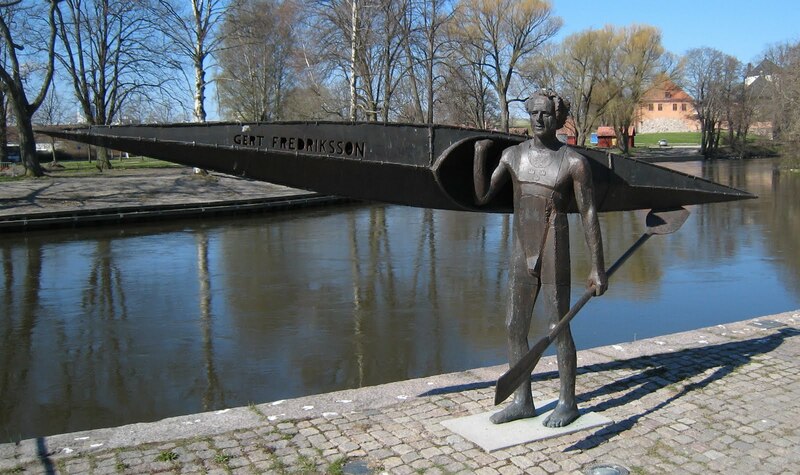 Plus, if someone builds you a statue to commemorate your status as a canoeing hero, you must have done something pretty remarkable. You know what Louganis, Phelps, Lewis, and Fredriksson all have in common? They didn’t have polio. It was uncertain that Ray Ewry, the most dominant Olympian of all time, would even walk again after coming down with the disease at the age of seven. This was over seventy years before Jonas Salk pioneered the polio vaccine, so young Ewry took the next best course of treatment for his legs: jumping. And jumping, and jumping some more. Eventually, Ewry jumped all the way into an athletic career at Purdue University, where he played track and football. It was here that he began to excel in the three events that would ultimately bring him Olympic fame: the standing high jump, the standing long jump, and the standing triple jump. From 1900 to 1908, Ewry didn’t lose a single Olympic event, winning ten golds in the three disciplines in which he competed. In 1900, Ewry set the world record in the standing high jump with a jump of 1.65 meters…which means that, in 1900, a 6’3” white guy had a 65-inch vertical. Tragically, basketball was still being played with peach baskets. Though the standing jump events were removed from the Olympic catalog after the 1912 Olympics, Ewry’s exploits still live on in history; his record for individual gold medals stood for 100 years before Phelps passed him this summer. And for his perfect mark of ten golds in ten tries, Ewry earns the distinction of the most dominant Olympian of all time. I was having this very same discussion this past weekend, and I thought of something that might help to measure “dominance” across sports: the approximate number of youths competing in a particular sport globally. While Gert Fredriksson may have dominated canoeing events, was he really competing against as many people as Phelps or Lewis? It would seem that the number people trying to compete olympically in a sport would determine the relative competition level, but I don’t know how attainable those estimates are. Standing high jump height is not the same as someone’s vertical. Sheesh. I’m sorry, but the level of competition in the early 20th century was a joke compared to what Phelps, Lewis, etc faced. Why do you think a dude with polio was able to be so dominant? Have to agree, and since there is no good methodology for estimating the number of youths training for jumping in 1904 is there a way to factor in the number of Olympic competitors to the equation? Lewis surely bested more 100m runners than either Fredriksson or Ewry. Given the history of the early games they were more of a world’s fair sideshow than true Olympic test, Ewry could have been nailing down gold medals in 8 person fields. Also, did Ewry compete in the 1906 intercession games? If so the added shot at medals would have the opposite effect to Lewis and Louganis missing out in 1980. The reasons mentioned in the above responses are the reasons why this post is about the most dominant olympians. Now, dominance is not exactly equivalent to greatness. Ewry definitely dominated his generation. No two ways about that.